The commercial application of MEMS, or micro-electro-mechanical systems, will receive a major boost today following the presentation of a brand new way to accurately measure the power requirements and outputs of all existing and future devices. The cheap and easy to apply technique will be presented for the first time today at the TechConnect World Conference 2013 by a research team from Laboratoire national de métrologie et d'essais (LNE) in France. The researchers believe it will help manufacturers improve product performance, develop new functionalities, reduce energy consumption of mass production, respond to market demands for miniaturization, and increase reliability of MEMS devices around the world. 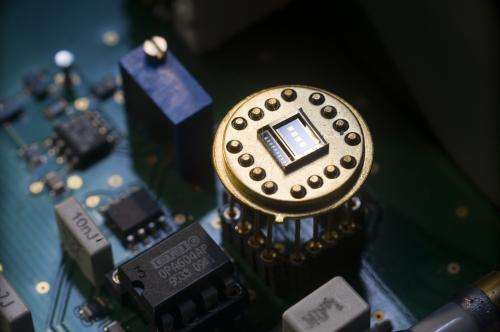 MEMS are very small devices that can be used as remotely powered sensors to measure variations in the physical environment such as changes in force, light, or motion, or conversely as actuators that convert changes in energy back into motion. They generally range in size from 20 micrometres (20 millionths of a metre) to a millimetre and made up of components that interact with the outside environment such as microsensors, and a central unit that processes data allowing MEMS to make decisions based on the information they receive. Despite these niche applications, the commercial growth of MEMS devices since their first development 50 years ago hasn't met expectations. This is partly due to a lack of understanding of the potential power requirements and outputs of these tiny devices. The problem is for many applications of MEMS the mechanical components must be embedded in protective wafer-level packaging. Without a way to access the mechanical system itself without breaking it, it is difficult for developers or customers to understand how to best utilise their product. To address this issue, Dr Alexandre Bounouh and colleagues at the Laboratoire national de métrologie et d'essais (LNE) in France, developed a brand new experimental set-up to gain accurate information on mechanical values and properties of any MEMS device through electrical measurement. LNE is one of seven national research centres across Europe that makes up the Metrology for Energy Harvesting Project. The project, funded by the European Commission through the European Metrology Research Programme represents the first co-ordinated international attempt to apply the principles of metrology (measurement science) to energy harvesting products and materials. Dr Bounouh's technique works by applying a current across the device with a varying frequency and allows you to analyse the harmonic content of the output voltage of the component parts. With some additional calculations the technique electrically determines all the mechanical characteristics of the MEMs device including the damping factor (a negative impact on the amplitude of oscillations), and the frequency that determines the maximum electrical power generation from mechanical vibrations of MEMS transducers. "It's very easy and quick to make the measurement because all you are doing is connecting your system with two wires, applying a current and sampling the output signal", says Dr Bounouh. "This method doesn't require any big investment but still delivers very precise knowledge of the parameters and limits in the performance of your device and could easily be scaled up to measure large scale energy harvesting technologies across the microscopic and macroscopic scales" . Since its development, several MEMS devices have been tested at LNE using the technique and their mechanical resonant frequencies have been measured with only a tiny uncertainty. In future Dr Bounouh and his colleagues believe the technique can be used to provide feedback on production methods that will allow manufacturers to design MEMS to the needs of each particular system they operate in. More accurate knowledge of the product output and energy requirements will also affect the choice of device from potential consumers who will now be able to select only those with optimised performance for their particular sector. "Our accurate and traceable technique could be implemented for on-line production tests and measurements," adds Dr Bounouh. "This could deliver key competitive edge to EU companies and support large-scale manufacturing excellence by introducing metrological principles into industrial processes."